I think that along with a white button down shirt black crop trousers are always on the list of items all women should have in their wardrobes and rightly so.. I used to have several pairs of black trousers that once I became a stay at home mum went in the bin, I was sick of the sight of them! However I always reserve the right to change my mind and simple black trousers have a place in my life once more! 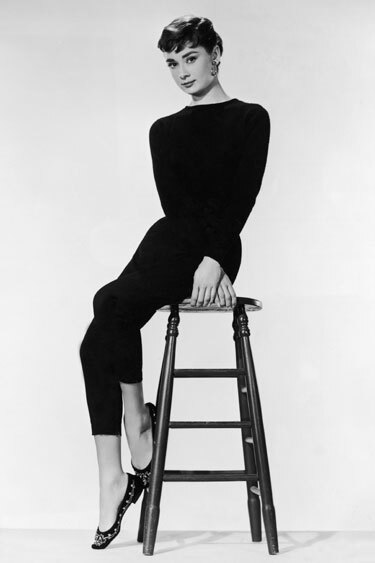 Pictures of the eternally chic Audrey Hepburn have re-inspired me. I wanted something the had a bit of a nod to menswear and finally settled on the Burda #107c ankle trousers and made them up using a wool suiting that is awesome, doesn't crease at all! It was also my first time with a fly zipper insertion and I couldn't have figured it out without the help of this awesome tutorial from lladybird which you can find here. The burda instructions were quite vague and not much help. I have done several fly zip insertions since and once you figure out what goes where its quite simple and a nice professional finish. I love the fit of these trousers and would like to make them again.